Is Your Name on the Vermont Unclaimed Property List? The Unclaimed Property Division of the Vermont State Treasurer Office reunites Vermont residents with their lost or abandoned money or assets. The Vermont State Treasurer Office receives these assets and keeps them safe until they are claimed by rightful owners or heirs. In fiscal year 2018, the Unclaimed Property Division handled 17,665 claims totaling more than $6.7 million. The average amount of cash that was returned to a person was $379.31. How do you see if you have unclaimed property? 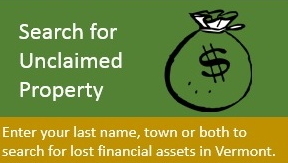 Visit the Vermont State Treasurer Office’s website and click on Search for Unclaimed Property. Enter your last name, your town or both into the search boxes. You can also call 1-800-642-3191. To claim any of your unclaimed property, you will complete a two-page form.